Explore Las Vegas in style and get an intimate look at one of the country’s most iconic cities. Your Certified Interpretive Guide will pick you up at your hotel in one of our custom Pink® Jeep® Wranglers, prepared to provide an unforgettable day. Take photos with fun pink memorabilia while enjoying trivia with your entertaining and informative guide. Our open-air vehicle puts you at the center of it all with great views and pleasant desert setting. 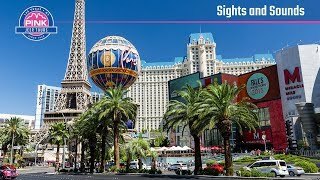 Your tour begins with a cruise down The Strip, where your guide will dive into the city’s history and urban legends while pointing out important landmarks. You’ll also be able to check all the famous resorts, casinos and hotels off your “to-see” list. Las Vegas has earned its reputation as “wedding capital of the world,” and you’ll learn why at your next stop. Hundreds of thousands of couples get hitched here each year at many at the quirky chapels you’ll see. If you’re lucky, you’ll spot some happy brides and grooms on their special day. Pose for photos and ask your guide how Las Vegas built the unique wedding industry it boasts today. A visit to the iconic “Welcome to Fabulous Las Vegas” sign is up next. Its classic neon has been welcoming visitors since 1959 and earned a place on the State Register of Historic Places. Your guide will tell you all about this unique piece of Americana before happily taking photos of you and your group. Cap off your tour with an unforgettable ride on the High Roller. You’ll step aboard a capsule that features wall-to-wall windows and ascend 550 feet into the air on the world’s largest observation wheel. Your guide will accompany you on the 30-minute ride to show you a side of Las Vegas that can’t be seen anywhere else. Admission to the High Roller is included with your tour, and bottled water is always complimentary. Interesting way to see an overview of Vegas- from one end of the strip to the other - including both the old & new Vegas. That was a wonderful tour!